Restaurants no longer can rely and depend on traditional word of mouth to market their restaurants. More and more restaurants are taking advantage of customers’ usage of mobile technology and attachment to digital media to increase their awareness and attract new customers. While some of restaurants are getting it right, many are struggling to get their marketing strategies right. With the help of some other restaurants (just like you! ), we will be featuring some helpful campaigns that your restaurant can begin implementing in the future to hopefully draw in customers you might not have had before. 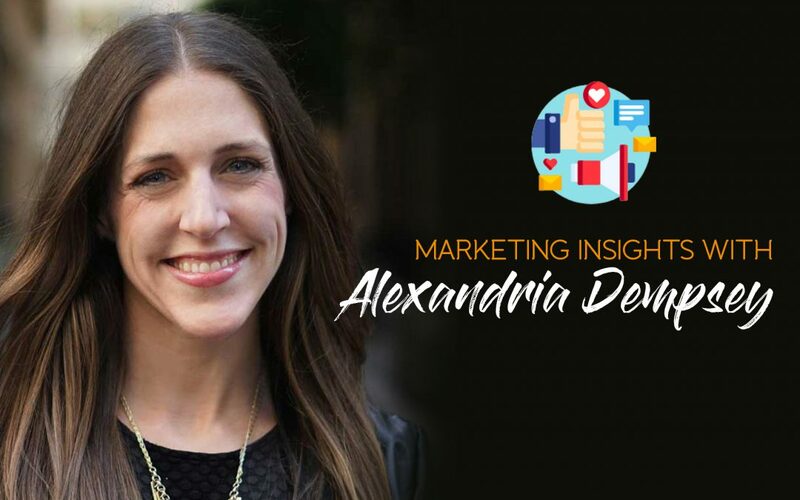 Here to discuss some important restaurant marketing components is Alexandria Dempsey, Vice President of Marketing and Branding at Puccini Group! For 20 years, the Puccini Group has been creating restaurants, bars, hotels, and resorts in partnership with the world’s most renowned hospitality brands. Their clients include many of the world’s leading hotel brands, including: Ritz-Carlton, Four Seasons, InterContinental, Hilton, Kimpton Hotels & Restaurants, and Starwood. Their team is also made up of several restaurant industry experts— sommeliers, cicerones, and managers of the Bay Area’s top restaurants — so they have mastered what works from both a marketing and operational perspective for restaurants. What has been your most successful marketing campaign? 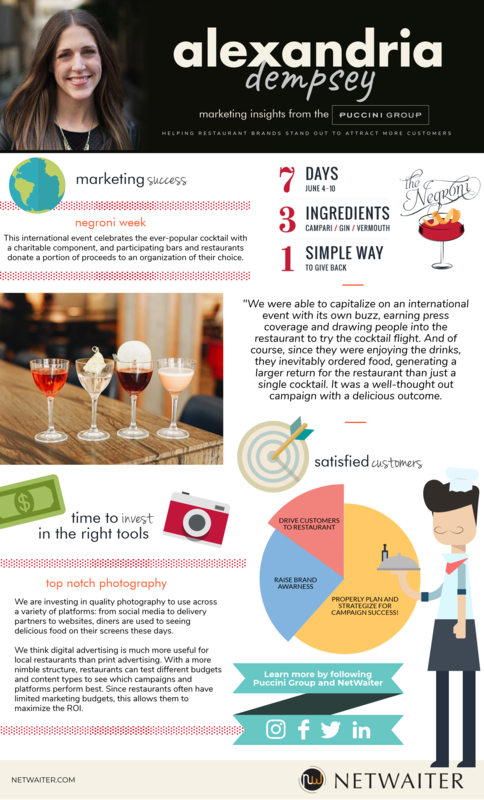 One of our most successful marketing campaigns this year was participating in Negroni Week. This international event celebrates the ever-popular cocktail with a charitable component, and participating bars and restaurants donate a portion of proceeds to an organization of their choice. At Tratto, a modern trattoria in San Francisco, our beverage director created a unique and compelling offer with a flight of four Negronis. We invested in professional photography and launched a digital and press strategy to drive awareness. Our social media content tagged the spirits we used in the cocktails, broadening the exposure of our posts. We were able to capitalize on an international event with its own buzz, earning press coverage and drawing people into the restaurant to try the cocktail flight. And of course, since they were enjoying the drinks, they inevitably ordered food, generating a larger return for the restaurant than just a single cocktail. It was a well-thought out campaign with a delicious outcome. Did you try a promotion or deal that completely failed? If so, why didn’t it work? This summer, we worked with a client to raise awareness for a new restaurant component to their existing urban winery. Our goal was to drive diners into the restaurant. The winery had an existing monthly event that we wanted to capitalize on in order to drive regulars to the food offerings. However, the campaign was rushed and included a larger number of points of information than we typically would execute in a single communication. We would have liked to see higher sales for the day of the event, and we could have potentially achieved this with a simpler campaign, or by waiting another week or two. What kind of marketing + restaurant tools are you currently investing in? We are investing in quality photography to use across a variety of platforms: from social media to delivery partners to websites, diners are used to seeing delicious food on their screens these days. We think digital advertising is much more useful for local restaurants than print advertising. With a more nimble structure, restaurants can test different budgets and content types to see which campaigns and platforms perform best. Since restaurants often have limited marketing budgets, this allows them to maximize the ROI.